My father had a difficult life. Born in Los Angeles, he and his mother Minnie (for whom I am named), moved to Brooklyn. She and his father were divorced, a rarity for the early 1930s. Within a short amount of time, Minnie tragically died of leukemia. My father, known as little George, received ample affection from his beloved Aunt Frieda and his Uncle Archie and his cousins big George and Lou. So much so, that Aunt Frieda and Uncle Archie were called Mom and Dad and his cousins were his brothers. Sadly, he did not receive the same from his father, Dave and step-mother Estelle. Despite that, he had an affectionate relationship with his half-brother Herb. His half-sister Harriet always called him Georgie. I remember a photo of his mother at his bedside, wearing a 1920s-style hat and a Mona Lisa smile. The early childhood loss of his mother had a profound effect on the rest of his life. He told stories of his Bowery Boys-type teenage life. He and a friend blew the side off a movie theater when they lit a match to see what was inside a tank. He went to Haaran High School in Manhattan. One of his fellow students was Vic Tayback, of “Flo” fame. Barely old enough, he enlisted in the Navy and served on the USS Missouri, where the WWII peace treatywith Japan was signed. 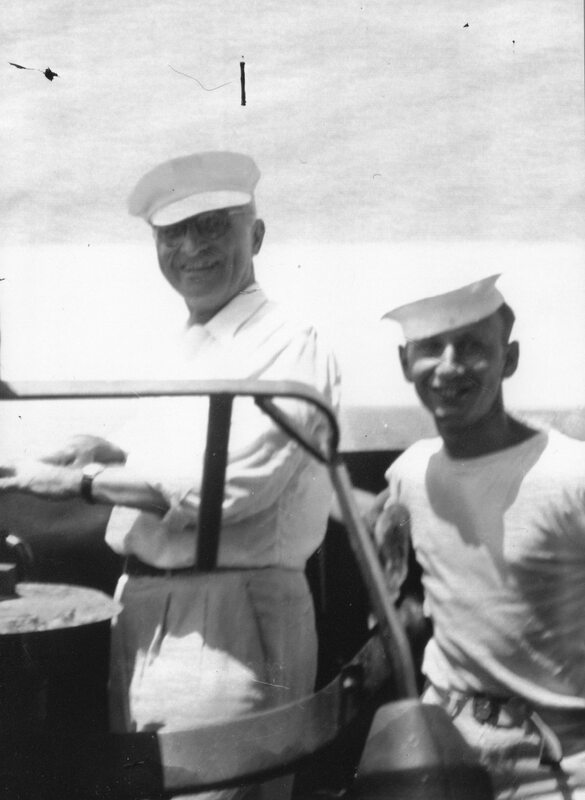 This skinny young Brooklynite received a plum assignment: bodyguard to Present Harry S. Truman. This photo has been a treasure for my family for over 70 years. My parents attended reunions of the USS Missouri Association, a source of great pride for my father; his Navy life was a high point in his life. We heard stories about his escapades in the Caribbean. onesus), where we lived before moving to Long Island. My father’s work took us to Rutland, VT, where my brother Don was born, and to Utica, NY. 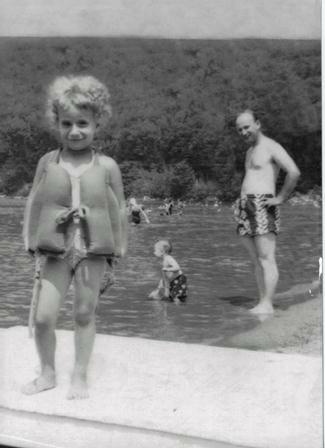 My father taught me to swim in Lake Branbury in Brandon, VT. When I was a little girl in Utica, he built me a “stove”out of a piece of furniture. I fondly remember attending a trade show with my father at the Hotel Manger in Rochester. He was in the linen supply business his entire life, as were his father, Uncle Archie and Cousin George. If a restaurant didn’t have linens, it wasn’t up to his standards. And any table with linens required him to look at all the tablecloth corners to see the stamp of which company provided the service. This was a man who stood on line at Shea Stadium so my friends and I could see the Beatles in 1965. What a 14th birthday present that was! When the Islanders made the scene at the Nassau Coliseum, he joined with us in buying “student tickets” and shared the glory years of our team. He always was a kidder, walking into the kitchens of local restaurants posing as a health inspector; going to dirty movies with my male friends; and placing the bows from gifts on the middle of his forehead. He was empathetic and embraced my friendships and anti-war politics with gusto. He provided a job for a friend of mine with substance abuse problems. He allowed that same friend to pay back a debt that resulted from those problems. He never had a bad word about anyone and was a man without prejudices. He sang (out of tune) funny songs, like “When it’s cherry blossom time in Orange, New Jersey, we’ll make a peach of a pear. I cantaloupe with you, my honeydew, underneath the apple blossom vine.” He loved Sinatra, Ella, Lena and comedy albums like “The First Family” and “Hello Muddah, Hello Faddah. I want to share one other story with you. One of my father’s customers in his business, Summit Linen Supply, was Zero Mostel. Did you know that Zero was an incredible artist? My father provided him with rags and the like. Zero offered my father one of his paintings. Imagine having an original Zero hanging in your home! Well, my father turned him down. That’s the kind of humble person he was. How I wish he had said yes. And how I wish he was here with us these past 20 years. I know Paul, my brother, cousins, Aunt Marcia, Mother, and nieces and nephew miss him as much as I do. What an incredible tribute to your dad! So well said Mindy.